We’re not talking about us (you can be the judge of that!) we’re talking about our websites. Stand out design and ease of navigation are two vital elements that make up any good website. But there’s one thing that’s often forgotten…sales. We want to know how your business works—what are your unique selling points? Who is your target market? What are the biggest issues you’re facing? We’re not being nosey – although, we do love talking about your business! We do this so we can better understand how your business works, and build you a website that’s designed for maximum results. So, whether you’re an ecommerce business looking for more checkout transactions, or a charity wanting to promote a powerful message, together we’ll figure out the best ways of making your website work for you. Take a look at our portfolio page to see our previous designs. Carer’s Trust, a charity based in Blackpool. Mobile-friendly Websites as a Minimum! 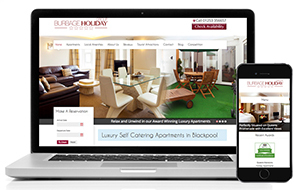 Mobile and tablet friendly – we don’t believe you should be charged extra for a mobile friendly website, so we include it as standard! CMS (Content Management System), which allows you to update your website yourself. We’ll even provide personalised training videos to show you how to use it!